A special snap SMS Morgan Poll (2,530 Australian electors aged 18+) after the ALP leadership ballot shows a large swing to the ALP 49.5% (up 5%) since last weekend’s multi-mode Morgan Poll, now just behind the LNP 50.5% (down 5%) on a two-party preferred basis after former Prime Minister Kevin Rudd was returned to the leadership of the ALP. The LNP primary vote is 43% (down 4%) still clearly ahead of the ALP 38% (up 7.5%). Among the minor parties Greens support is 8.5% (down 0.5%) and support for Independents/ Others is 10.5% (down 3%). If a Federal Election were held today the result would be too close to call according to the special snap SMS Morgan Poll on Federal voting intention with an Australia-wide cross-section of 2,530 Australian electors aged 18+. Analysis by Gender tonight shows both genders swinging towards the ALP after Rudd’s return. Women now favour the ALP (51%, up 4%) cf. L-NP (49%, down 4%) on a two party preferred basis while men favour the LNP (52.5%, down 5.5%) cf. ALP (47.5%, up 5.5%). Gary Morgan says: “A special snap SMS Morgan Poll conducted immediately after the results of tonight’s ALP leadership ballot shows the ALP (49.5%, up 5%) now almost level with the LNP (50.5%, down 5%) on a two-party preferred basis after the return of Kevin Rudd as the ALP leader. Finding No. 4997 – This special snap SMS Morgan Poll on Federal voting intention was conducted this evening via SMS interviewing after the result of the ALP leadership ballot was announced, 8pm June 26, 2013 with an Australia-wide cross-section of 2,530 Australian electors aged 18+, of all electors surveyed a low 0.5% did not name a party. All who will not vote for libs want Turnbull for lib leader, I can’t stand Rudd, but when asked I gave him the thumbs up, just being a stirrer. The electorate is all fired up and talking about politics. This is good for democracy. Got into an argument last night with a ‘rusted on’ female guest, but today I found accord with a plumber who had come to fix a leak. I hope he did a better job than the one who tried fix up the leaking caucus. The rusted old biddy was profoundly ignorant on most issues and held strong opinions, while the jovial plumber said having Rudd back is unhelpful. Small business has turned against Labor, so we would prefer to see the conservatives come home with a mandate to rule. His stance on climate change makes him unfit to be leader of the Liberals, it would split the Coalition. When Turnbull was leader of the opposition he was unpopular, then he crossed the floor to vote with Rudd, then he was so unpopular he was dumped. 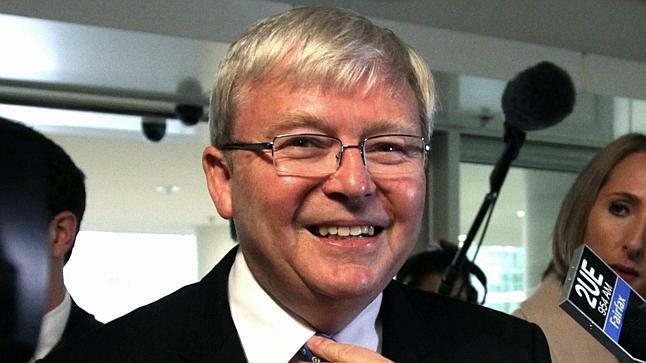 Can’t see him as leader again, but, I never thought that superficial little shite Rudd would be back either. Time will tell though. Need to see results in a couple of weeks after things have settled a bit & the novelty wears off. I bet it’s given the loathsome Abbott pause though. * guffaw! A straw poll in town and all agree … a tax on the air we breath is dodgy and not a vote catcher. But I’ll look further afield and get back to you. Here’s something, but we won’t know the true impact until after the financial year. The ALP front bench now looks reasonably competent, with Bowen as treasurer and Albanese as deputy. If Swan survives he has Rudd to thank. But it’s a pity he doesn’t just piss off. Apparently she also gets free air travel for the rest of her life.